Archcore farm buildings are ideal for all your needs. They are simple to erect, durable and offer the most cost effective solution for your agricultural building budget. Archcore agricultural steel buildings are referred to as "The Farmer's Friend" because they save you money, are maintenance free and last a lifetime. These pre-fabricated buildings are 100% manufactured in the USA and backed with a 35-year warranty. Our farm buildings are the perfect fit for storing combines, tractors, front end loaders and hay. Archcore agricultural metal buildings are 100% clear-span and have no beams, trusses or posts on the interior, allowing complete use of your building's space. Our crop storage buildings are designed for a tight seal, making it ideal to store large amounts of commodities cheaply without any special side liners or bracings. These high profile arch buildings design allow you to park a tractor very close to the wall for maximum use of the building. Whether you use round or square bales of hay, Archcore has you covered. We understand that keeping your hay dry and mold free is key. Stack your round bales three high and leave the ends open for ventilation and easy access. This allows any freshly cut green bales to be ventilated properly and reduces the chance of fires. Enclose the building with sliding doors and stack your square bales as high as you need. You will save money and time not having to contend with hay loss as a result of moisture and inclement weather, creating moldy or rat-infested bales. 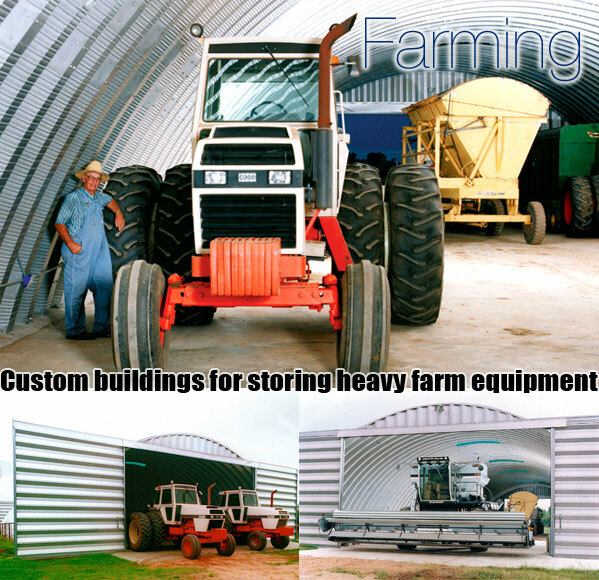 Archcore steel buildings are the most effective and cheapest way to store hay. Check into current Government tax discounts for your agricultural use.